Whether it's the coupe or the roadster, the BMW i8 series features the luxury that you've grown to love in this vehicle as well as the speed that you desire in a BMW. Both vehicles have an iconic design that will make them stand out on the road in Bentonville. 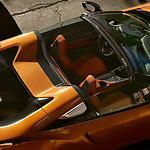 Reach 60 MPH in less than five seconds as you feel the wind blowing with the top down. Total horsepower is listed at just under 370. Each line is designed so that it's precise from the hood to the bumper. Doors open in a scissor design, making the vehicle easy to slide into. Jet black wheels on the vehicle give it an aggressive appearance while maintaining the classic design that you're accustomed to seeing on a BMW. The Roadster is a two-seater vehicle, allowing you to spend a little time alone on the road or with someone special. The Roadster gives you the sleek appearance and performance of a sports car with the fuel efficiency of a vehicle that runs on electricity.